In 2001 my 6 year old son felt lost, unheard and bereft at school. 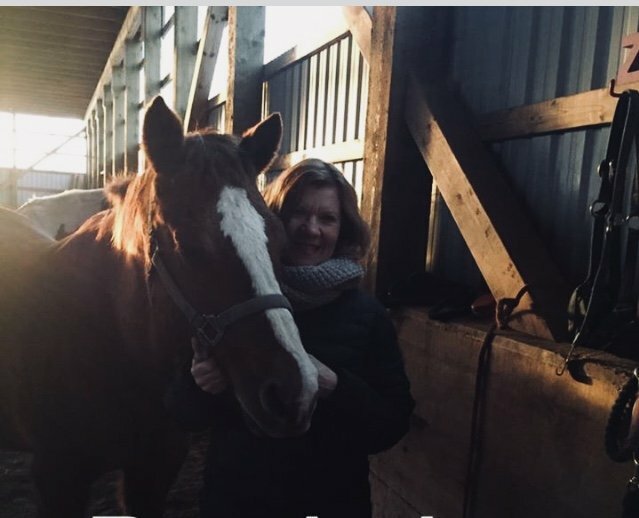 It is thanks to Sue McIntosh and her Healing Hooves team releasing him from his fears and sorrow that I am aware of the depth, beauty and source of renewal that is the provision of Equine Facilitated Wellness. 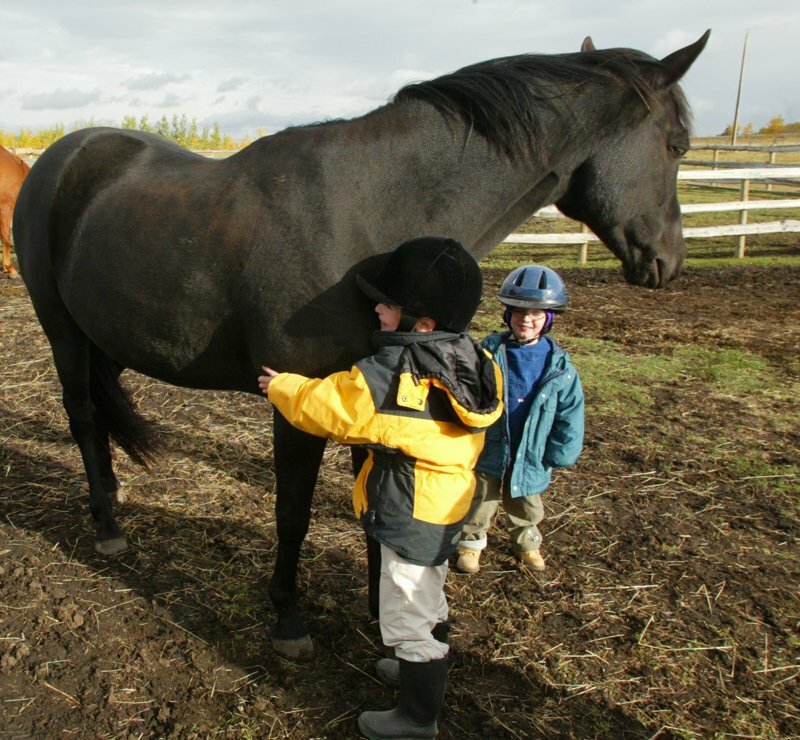 My son connected with Sue’s horse, Dubh, because previous owners had not paid attention to his needs or hurts. It is infinitely beautiful to watch one’s shy, lonely and troubled boy become whole, happy and excited. A transformation occurred because of all Sue taught him about horses and the space she allowed him to explore, encouraging him to see himself as capable, smart, lovable and a horse lover. 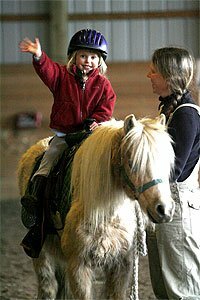 I am forever grateful for the sense of joy she and her horses instilled in my little boy to dig deep and look for who he really is beyond any suffering he once thought defined him. 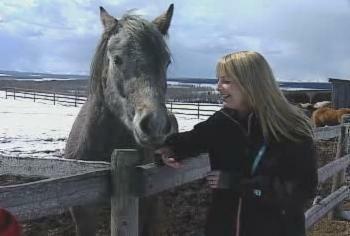 In 2015 Sue invited us to reconnect with Dubh and be part of a documentary about equine therapy at her farm on the show ‘Wild About Animals’. It has been an honour and privilege to learn and grow with Healing Hooves as a mother and as a trainee. 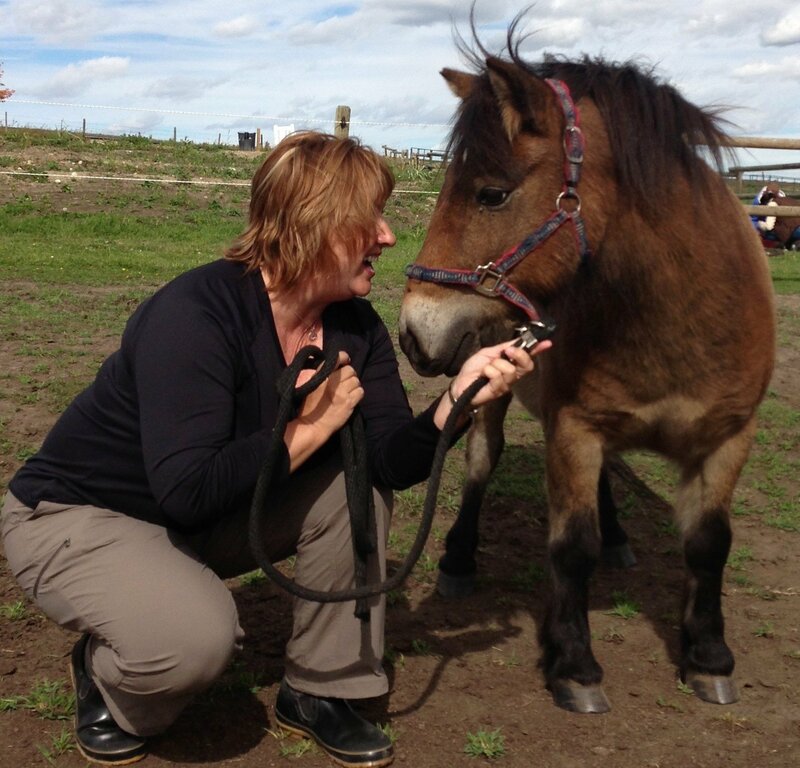 Sue’s therapeutic skills, human and horse wisdom and the support she provides to clients and EFW recruits is remarkable. Thank you Sue for making our story one of hope, strength and renewal. In 2013 I began my EFW training Journey with Healing Hooves. I really didn’t know what to expect, only that I had a 10 hour drive through the mountains to get to a place I loved (Southern Alberta). I already had a background in psychology, facilitation and trauma informed practice and when I walked through the doors at Healing Hooves, something magical happened. I knew I was in the right place and the teaching and learning fit perfectly for what I had as a vision for my work. The Neufeld Attachment work has enriched not only my EFW practice but also my work as an Anger Management/Family Violence Facilitator at the Northern John Howard Society here in Prince George, BC. I’ve been going back every year to continue my EFW education and to assist with facilitating workshops. Sue’s place has felt like home right from the beginning, this is of course supported by her homemade baking… I have appreciated the opportunity to be part of the Healing Hooves family and would highly recommend any of the workshops and seminars that they offer. 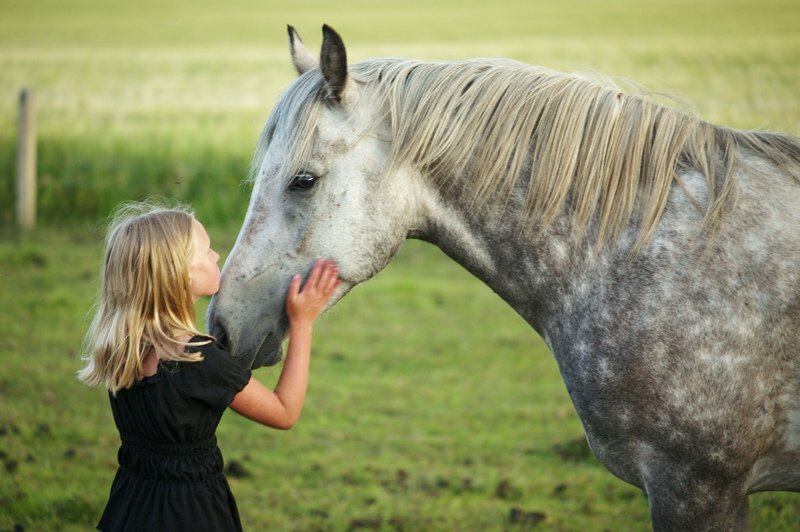 It’s not just the power of horses you feel at Healing Hooves but the power of friendship, of family and of nature. I came to healing hooves in a very telling time in my life after going to a handful of therapists, counsellors etc. Family friends of ours suggested making the drive out to healing hooves facility. Normally hesitant and annoyed with such a suggestion I was excited to see the horses, at least I could gain something from their friendship if nothing else. As soon as we arrived I was instantly comforted by all the furry faces and Sue was patient with me in the sessions that followed. We worked through a lot of my issues and she helped me with my confidence in building my relationships with the horses, we visited regularly and it didn’t feel like therapy; it became something I could look forward to, something constant, safe, a place where I could be myself. Sue and the animals at healing hooves helped me to become the person I am today and for that I am forever thankful. Reaching out to Sue has turned out to be the best parenting decision I’ve ever made! I contacted Sue because I have a son with special needs and need help with the many complex challenges he and I face every day. Reaching out to Sue has turned out to be the best parenting decision I’ve ever made! 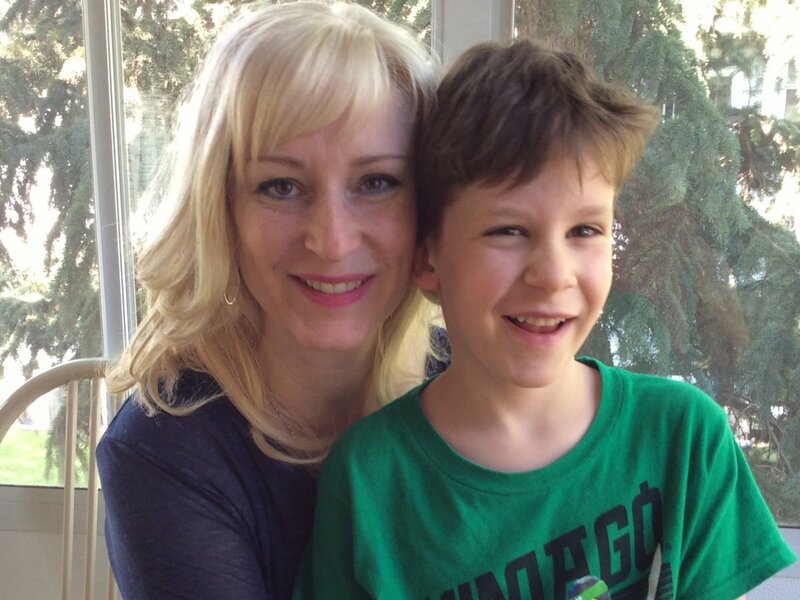 The attachment-based approach she’s teaching me has helped me understand and meet my son’s needs far more gently and effectively than any other method I’ve tried. Sue’s therapeutic children’s books are must-reads! My son loves her endearing stories about her ponies, such as Holding On and Molly and Cutie’s Run, which are a fantastic resource for illustrating that feelings of frustration and sadness are normal and ok, and that it’s healthy to express them! I’m tremendously grateful for all of Sue’s help. Her sensitivity, warmth, insightfulness and professionalism are remarkable. I highly recommend services and resources from Healing Hooves! I initially met Sue McIntosh almost 9 years ago when I attended my first EFW Training at Healing Hooves. My trainIng experience was so positive that I pursued fulfilling all of my EFW Training requirements at Healing Hooves, under Sue’s guidance. Many years later, I continue to look to Sue as a leader in the field of EFW and as a personal mentor and colleague. Her Developmental and Attachment based approach to EFW has greatly influenced my own Clinical Social Work practice. As a result of my training with Sue, I have had the privilege of offering EFW opportunities to my own clients through my private practice, Heart of the Horse Wellness over the past 8 years. Although I do not see Sue often enough, I am reminded of her frequently as I share her wonderful selection children’s stories with clients of all ages. Sue’s short stories offer a multitude of clinical opportunities that enable clients to explore and identify vulnerable emotions, process personal wounds and explore relational complexities in a non-threatening and “once removed” manner that serves to enrich individual and group sessions as well as promote healing for many clients. Thank you Sue for all that you do to enhance the field of EFW with your knowledge, impeccable ethics and warm heart. I have been coming to Healing Hooves for awhile now….it is truly a place for healing….Sue has a way of making you feel safe and comfortable…..I was very nervous when I arrived the first time as opening up is not easy for me but before I knew it Sue with her very gentle approach, and having a cat on my lap purring away, had me feeling so relaxed and at ease I had completely forgotten about my anxiety for that hour and half….and “Disa” she is my girl. 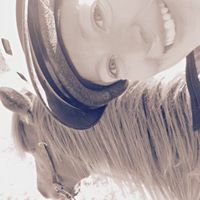 All the horses are so wonderful, I just happen to have a very special connection with Disa….she is my comfort!!! 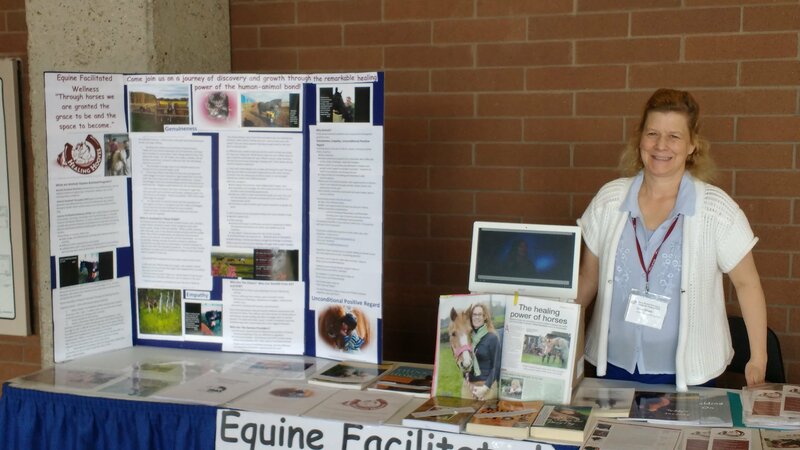 I first came across Sue McIntosh and her EFW training program at Healing Hooves late in 2016. I was extremely frustrated as I had been searching long and hard to find a training program in ‘Equine-Facilitated -Something’ that aligned with my values and personal and professional ethics as a practicing mental health professional as I wanted to introduce an Animal Assisted/Equine Facilitated component to my practice, and had not found a program that came close to what I was looking for. Since 2014, I had been building towards adding horses assisted activities to my work as a counsellor with some of my clients where traditional office sessions weren’t working for them. 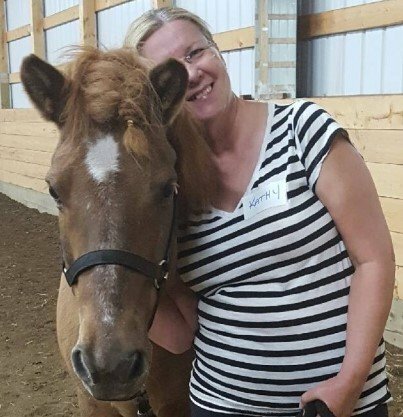 In 2015 I enrolled in a training program for Equine Assisted Learning, which was run in a 1-week training with ongoing support to assist in building the business portion of my practice. Although I took away many skills and specific goal oriented exercises for life skills development from the earlier training in EAL, I was wanting and needing more in depth training and skill building that encouraged me to grow and develop a practice that was unique to my skills and vision as a helping professional. I enrolled in Sue’s EFW training stream in the spring of 2017. It was the wisest and best decision I made for my development and growth as a provider of Equine Facilitated Wellness (EFW) programs and services. Sue is a highly skilled, professional, knowledgeable teacher, and an industry leader on the cutting edge of the development and evolution of EFW in Canada and beyond. Personally, Sue is kind, empathetic, humorous, and a patient teacher and mentor. At her EFW training sessions, Sue creates a dynamic space for learning, allowing time for questions and concerns to be explored and answered. If you are considering Sue’s training at Healing Hooves, I highly recommend attending the Exploration Workshop to help you in your decision making process. This is a journey you must experience first hand to really feel the full impact and depth of Sue’s training, skills and the wonderful field of EFW. Sue McIntosh, MA, CCC the founder, lead counselor, trainer, practitioner and author of Children’s Therapeutic Stories from Healing Hooves became my role model for best practice standards in the field of equine facilitated wellness (EFW) specializing in attachment and developmental psychology in 2010. After thoroughly researching educational programs and training facilities across the US and Canada, I found my fit and niche with Sue and her healing support team, both 2 legged and 4 legged. For 8 years now and counting, Sue as a mentor has guided, encouraged, challenged, advocated and believed in me as her student. There has been more than one occasion when I felt I had lost my way, that if it wasn’t for Sue’s support, I might have truly stumbled and fallen. EFW training and professional development is a rigorous undertaking. One needs the experience of a dedicated esteemed teacher in the field to help navigate the way. Sue’s willingness to share carefully researched resources, provide both printed and online manuals, deliver in-person instruction in various teaching styles, arrange for hands on practice, supplement her own teaching with guest teachers in coursework, and continue her own training set a gold standard for program development. The animals on the welcoming, organized, peaceful yet fun farm that Sue and her team oversee in Alberta, CA provide numerous diverse opportunities for engagement, training practice, reflection and bonding. A mini pony, Teddy, became my muse for moving forward in the EFW field and framing my own mission for providing attachment based EFW programming. 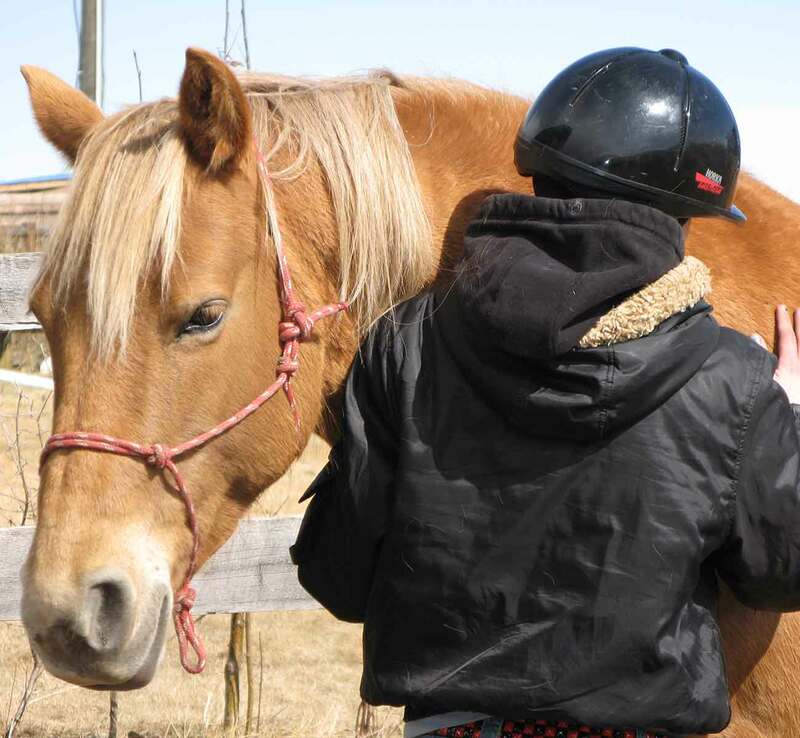 Structure, safety (emotional and physical), soundness (animals and people), sensibility and fostering secure attachment are principles that I experienced first hand in Healing Hooves and now incorporate into my own practice along with resources from Sue’s program such as her Children’s Therapeutic Stories. 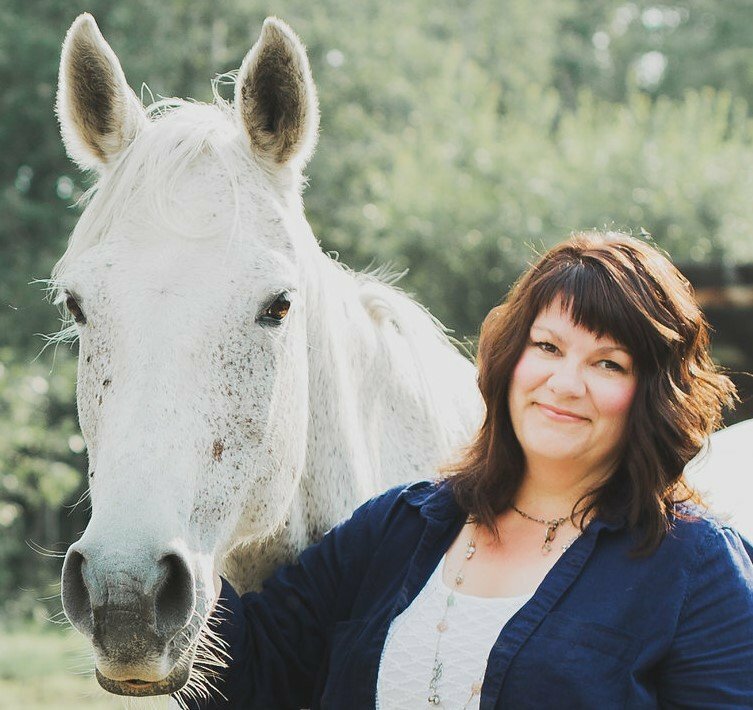 If you desire to learn and grow, both for personal and professional development, then I encourage you to connect with Sue McIntosh at Healing Hooves and explore the potential for your best fit! I met Sue 8 years ago when I took part in her introductory workshop. Since then, I’ve had the opportunity to volunteer at Healing Hooves working with youth who have experienced domestic violence. I’ve also worked with Sue on a number of counselling groups including designing and co-facilitating groups for survivors of sexual violence, as well as groups for women contending with eating disorders. Sue is passionate about her work and this shines through in her business and practice. 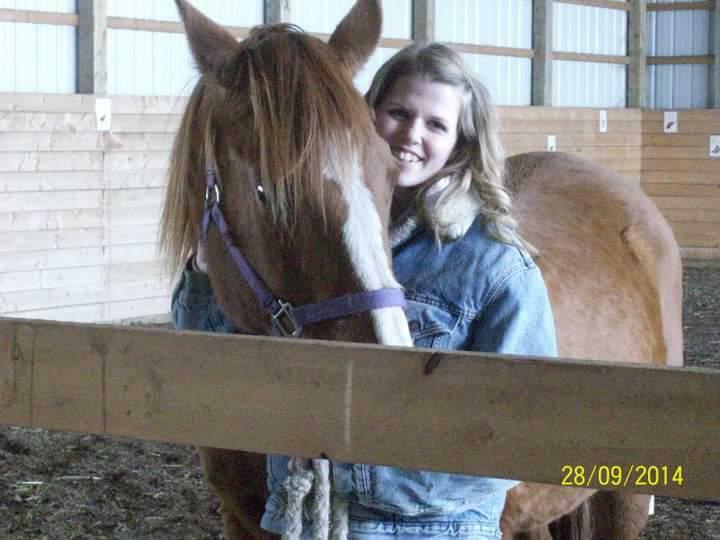 She is a creative and caring professional who is dedicated to her clients, her horses, and her staff. I’ve always appreciated the approach that Sue uses in her work- listening for the unspoken, looking for moments of healing and change, and fostering hope. Healing Hooves is a special place because of Sue and her horses; I know it has made a difference for many people. My name is Angela Miller and I am Certified Canadian Counsellor as well as a Registered Provisional Psychologist. Around two years ago I began the process of certifying as an Animal Assisted Therapist with my canine co-therapist Rossi. As part of this process I was required to find a mentor/supervisor to help in this process. Sue McIntosh from Healing Hooves was recommended to me as a potential supervisor and one of the forerunners in Animal Assisted Therapy, specifically Equine Assisted Therapy. Sue agreed to be my supervisor and we have been communicating through phone once a month for about a year around the ethics of Animal Assisted Therapy, specific intervention strategies when working with animals in therapy, particularly when it comes to working with my canine partner Rossi. Sue has been instrumental in providing me resources, validating and providing feedback around my private practice and in general been supportive in the journey of pairing my canine partner Rossi with my counselling practice. Through supervision with Sue, her passion in working with animals, clients and other professionals comes shining through. She is always willing to share her knowledge and recommend resources to help me become a well-rounded Animal Assisted Therapist and I am thankful to be working with such a kind, compassionate and knowledgeable therapist such as Sue McIntosh. Other Feedback From Clients …. “Thank you for letting me see what it feels like to cry happy tears for once”. “You have opened a whole new door in my mind”. “I went there with the expectation to meet and interact with horses and came out with so much more. Learning so much about horses, just LEARNING”. “It was the best experience of my life”. “He has his own attitude towards people and he really cared for me. He gave me a lot of hugs”. “They were loving and trusting to me” . “Help is good for me”. “I’ve learned that I am a gentle person yearning for someone’s respect and affection. I’ve learned that I have things to offer others”. “I grew a bond with people who don’t judge me or expect things of me. I have a good bond with myself”. “I learned many things. I didn’t want to trust and I was scared of being happy again. There is a lot more to life than the bad times”. “I learned that I can be good around horses. That animals like me”. “They were more than just group leaders. They were our friends”. “They were so fun I just enjoyed myself”. “They were very friendly and down to earth. They never made us feel like ‘clients'”.